How to make homemade whole grain mustard? What are my favorite recipes that are best with whole grain mustard? 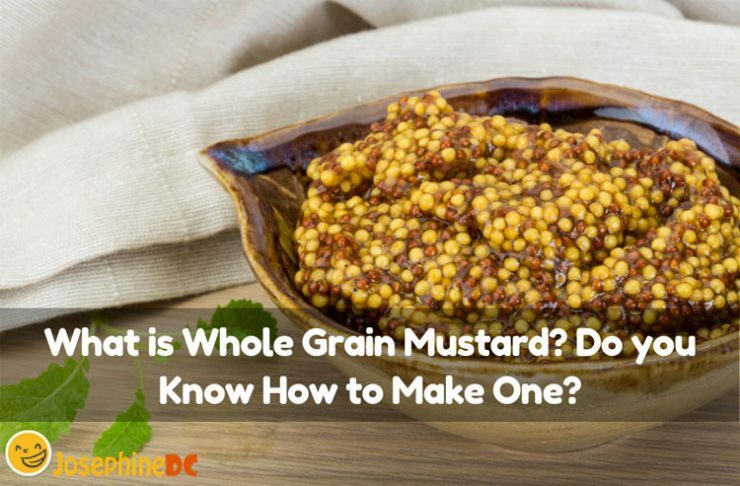 What are the uses of whole grain mustard? What I love about whole grain mustard is the rough texture that touches my tongue with every bite. If I have to choose mustard for my cheese plates and a ham sandwich, I will go for this one. It is perfect for salad dressings as well. Do you want to know how my grandma makes whole grain mustard? I consider whole grain mustard as a condiment. I make sure to have this ready in my pantry at all times. You know this is the quickest ingredient I could grab for salads and the children’s school sandwiches. Let me share with you how simple this hand-me-down recipe to make! You need a total of 12 hours to prepare this recipe. However, you can chill this for two weeks in the fridge before using for best taste. Homemade mustards could last up to six months if properly packed and refrigerated. Hence, store it in a covered container. In a bowl, dispense both the yellow and brown mustard seeds and start mixing. You can use your measuring bowl to blend them in well. 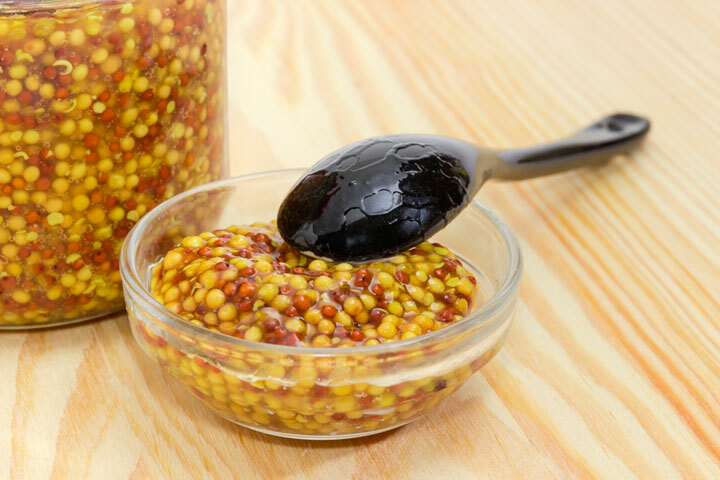 Pour the beer and vinegar to your well-blended mustard seeds. 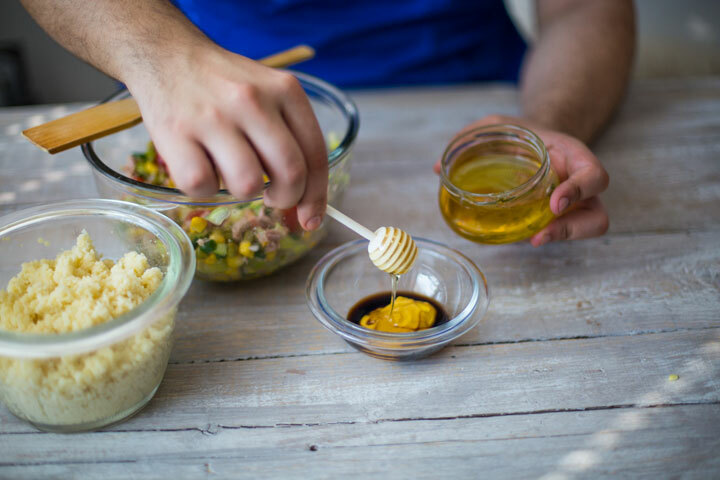 Use your whisk to mix the mustard further and for the beer and vinegar to blend in properly. Cover the bowl with plastic wrap and allow the mixture to settle. I left mine on the kitchen table for straight twelve (12) hours. The set time should be enough to let the seeds absorb the liquids. After twelve (12) hours, pour down the soaked mustard seeds in a food processor. I used my good old blender to do the job. Pour all the rest of the ingredients (brown sugar, honey, and salt) as well. Pulse it a few times at first just to mix all the ingredients inside before processing it for a minute. When done, pour all the mixture into a clean jar and cover. Refrigerate and let it settle down for at least two (2) weeks. This recipe can make about 1 ½ cups of whole grain mustard. As I have mentioned, whole grain mustards is difficult to find in your local grocery stores. Therefore, if you are trying to make one, knowing the common substitutes could be a big help. Finding a replacement for this rough texture, peppy taste, and delish punch of this whole grain mustard could be a challenge. 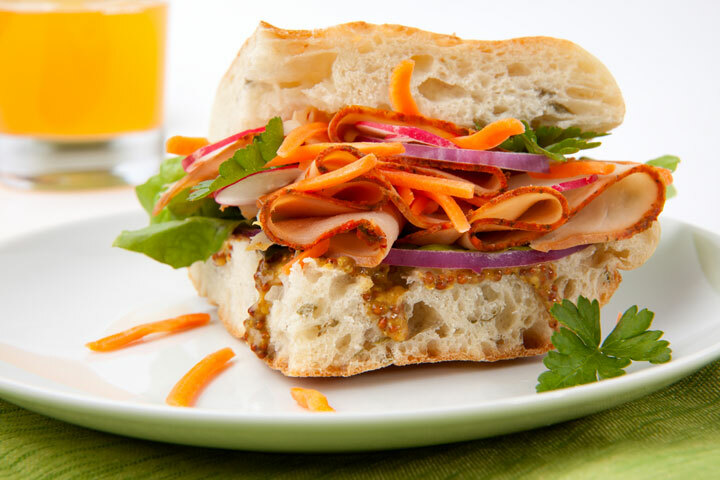 The acidic kick of this mustard mix adds up to the excitement of every mouthful of your salads or sandwiches. Coarse-ground mustards and stone-ground mustards are easy substitutes for whole grain. Nevertheless, what if there is none of these around as well? When looking for substitutes, pick the selection that offers the nearest to the same texture and taste. You can buy this root in the nearest groceries. You may find it usually stored in jars. Horseradish is an excellent heated substitute. It does not exactly offer the same taste, but it vaguely resembles the flavor of whole grain mustard. Whether you will find the root as fresh, jarred, grated, or shredded, it will still serve the same. The mixture will give the same rough texture when spread to your sandwiches. Just a few dashes of cayenne pepper can match the heat of a whole grain mustard seed. Of course, it cannot provide the same grainy texture that you are accustomed to having. However, for recipes that do not need the same texture, this substitute, is useful. Try applying this replacement mix to your salad dressings and dips. Wasabi and turmeric, on the other hand, are also a perfect substitute besides cayenne pepper. A little warning though that these replacements are far too hot compared to whole grain mustard. Make sure to adjust the amount that you are going to use. Have you been wondering what makes whole grain mustard stands out from the rest? Well, it depends on everyone’s own preference in taste actually. For me, whole grain mustard has always been my choice amidst the rest of its kind. Maybe because the food that I like most are those that go best with whole grain mustard. However, mustards are multipurpose and can be useful to any sandwich, meat, and salad recipes. Do you want to have an idea on what food that shines more when served with whole grain mustard? I could tell you some of my favorites if this could help you to appreciate whole-grain mustards more than before. Chicken, apple, and fennel salad: Do you think your chicken salad is boring without all the mayonnaise and the crunches? Well, the problem is history with a bit of whole grain mustard dressing. It does not only makes your salad creamy and crunchy but makes it more spicy exciting! Sardines with Rye Crackers: When I deal with oily favorites, whole grain mustard lessens the greasy taste. Adding the mustard with the rye crackers and sardines brings back my old college days when eating this combination makes my day. 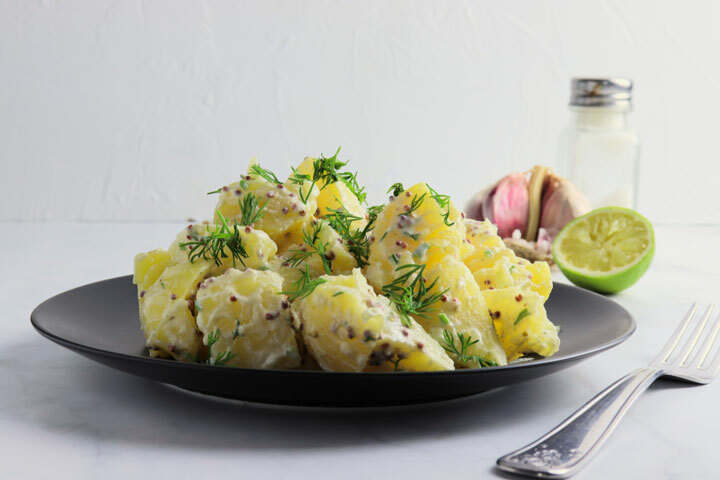 Frisee Salad with potatoes, apples, and hazelnuts: Thanks to my good old days when eating this delicious and sweet salad, mix with the heat of what whole grain mustard dressing can offer makes a friendly chat a perfect moment. Bresaola and Cheddar Toast: For days wherein I crave for toast, the combination of cheddar cheese and bresaola become comfort food for me especially when I blend in a spoonful of whole grain mustard. Barley and Arugula Salad with Pork and Mushrooms: I could get lucky to find myself some pork tenderloin and barley of what a blast of a party left for me to eat. Then I dig in with some whole grain mustard to pair it with and the rest of the night is complete. Well, I have already mentioned to you that I cannot eat my favorite sandwich and make a salad tasty without some whole grain mustard. Then, what are the uses of mustards anyway? Can I use it in different ways? Whole grain mustard is perfect for dips. If I have pretzels at home, a bowl of whole grain mustard dips can make the snacks for movie night more interesting. Try whole grain mustard dressing for your vegetable salads and find out how outstanding it makes the greens more inviting as appetizers. What more can you ask for when your Christmas ham would have a unique spicy taste. It just makes dinner super-hot! Do not think that whole grain mustard is just for dressings and dips. It is excellent when it comes to pan sauces for your cooking adventures. No, honestly, I do not use whole grain mustard for a sandwich spread alone. However, it brings out the best flavor for the salami, ham, cheese, and the lettuce for my club sandwich. What is whole grain mustard? Are you familiar with it now? Try buying it from designated stores in your area and find out how true I sound to be. I have shared to you my favorite recipes that go well with it, and I even gave you my grandma’s recipe. If this is your first time to try whole grain mustard, you can use it first in dips and check whether you like how it tastes. You can also try the substitutes in my recommendation. Good luck!